If you had $120,000 to spend on wine, what would you buy? Lettie Teague gets an answer from the iconoclasts behind Manhattan’s much-anticipated Marea. If you’ve ever looked at a wine list and wondered why it featured 14 Pinot Grigios and only one Viognier (or vice versa), then we’ve probably thought the same thing: How do these lists get put together, anyway? As one who has read a lot of wine lists over the years—admittedly with as much trepidation as hope—I finally went out to find the answer for myself. I decided to witness the creation of a wine list to discover firsthand how (and why) certain wines were chosen and others left out; why specific regions received star treatment while others were virtually ignored. And of course, I wanted to know how wine directors came up with prices, too. I already knew the wine expert I wanted to follow: Chris Cannon, who was about to open a new restaurant, the Italian, seafood-centric Marea, in a space on Manhattan’s Central Park South. Chris has been in the restaurant business for 30 years. He’s the co-owner of the much-lauded Italian spots Alto and Convivio, for which he created two of the city’s best wine lists. Chris is considered one of the country’s foremost Italian wine authorities, and I can attest that his familiarity with obscure Italian varietals is greater than that of any other wine professional I know. 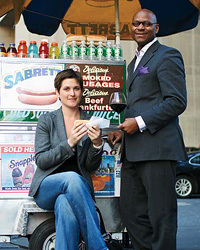 What made Chris and his partner, chef Michael White, decide to open a restaurant at this particularly challenging time? “A recession is the best time to launch a new restaurant,” Chris replied when I met him at Marea-in-the-making a month or so before its debut. Although his statement might seem to smack of bravado (false or otherwise), his rationale was compelling: “It’s cheaper,” he remarked cheerfully. Prices had dropped in other areas as well. “Seafood prices are down 40 percent. Even lobster is down 34 percent. And these prices are going to stay down for at least eight months,” Chris opined. He couldn’t help describing the seafood in detail, from Pacific sea bream and urchin to the Maine oysters for Marea’s raw bar. As an owner of a new restaurant, Chris had to deal with a lot of other issues besides the wine list, including a flooded basement and china held hostage by customs. (And those were just the problems on the first day we met.) That was why he hired a wine director, Francesco Grosso, to work on the Marea list. Francesco, a short, thin, well-dressed fellow, looked like the most dapper member of his sixth-grade class, though he was in fact 31. Chris said that he and Francesco had a busy tasting schedule in the weeks ahead; they had already been to three or four tastings before I contacted him, and they would attend another 10 or 15 before the list was finished. They were scouting for hundreds of different labels, though they wouldn’t actually buy any wine until a week or two before the restaurant opened. The liquor license was still pending; these often don’t come through until just a week before a restaurant’s launch. The other reason that Chris wasn’t buying wines right away was that there was no place to store them. “Where would I put them?” he asked rhetorically, with a sweep of his arm that encompassed the sawdust-filled brown-papered room that would very soon be transformed into a wood-paneled, honey-onyx-marbled, $4 million space. “When we started the project in January, the euro was worth more than it is now,” said Chris. “That’s great, because we’ve been importing a lot of stuff from Italy. It’s good for wine prices, too.” Chris is always scouting for a deal. He’s a man after my own heart in that way, even if I don’t share his enthusiasm for, say, Asprinio, a chalky white wine from Campania that tastes a lot like its name would imply. Although all of his wine lists are Italian-focused, Chris avoids loading them with big-ticket Barolos and Super-Tuscans in favor of wines with unpronounceable names from little-known places like Elba. There are only a handful of wineries on Elba, that tiny Italian island where Napoleon was exiled, but Chris knows every one of them—and which three produce wines that are worthwhile. When Marea’s wine list was completed, it would have roughly 300 selections, said Chris; he and Francesco were open to “any wine that goes with fish.” After all, Chris reasoned, “The food always comes first.” And when the food is from a stellar chef like Michael White, this seems like common sense. While White wouldn’t be directly involved in developing the list, he “cares a lot about wine,” according to Chris, and was busy creating dishes with wine-friendliness in mind. Chris and Francesco had purchased around 14 cases of various wines at auction several weeks before we met, particularly great Chablis from producers like Dauvissat and Raveneau. “Chablis is the greatest oyster wine in the world,” Chris explained. They had only placed absentee bids. “Never attend an auction in person,” he advised. “If you do, you always overpay. 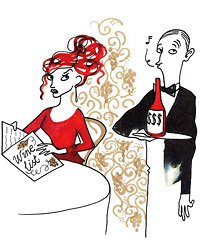 If you put in an absentee bid, you won’t go past your maximum.” They’d paid very reasonable prices; in fact, they made some low bids and won most of their wines. Chris had allotted a mere $120,000 to Marea’s opening wine budget; he explained that they’d be buying “crisp, bright, youthful wines, like Verdicchio, Vermentino and Soave,” which didn’t tend to cost as much as the bigger, more serious wines at Alto or Convivio. There wouldn’t be much overlap among the three restaurants, especially between Alto and Marea, as the former features many more trophy reds. “Our wine inventory at Alto is probably worth about $2 million,” Chris speculated. “Or at least it was,” he added with a laugh, alluding to the recent drop in wine values. The Marea list also needed what Francesco jokingly called “a Frank Bruni wine,” in honor of the New York Times’s influential restaurant critic. Bruni often singles out very old white wines for praise in his Times reviews; he once extolled a restaurant’s geriatric 13-year-old Soave. Though he said very little compared to the voluble Chris, Francesco spoke with knowledge and confidence. He had grown up in an Italian family; his father was born in Campania. I wondered if that helped him get the job, as Campania happens to be one of Chris’s favorite wine regions. Panebianco then poured us glasses of Dorigo Brut, a Chardonnay–Pinot Nero sparkling blend from Friuli (a region in northern, not southern, Italy, of course). It was pleasant enough, though not compelling. “If I were blindfolded, I would think this was Prosecco,” Francesco said. Panebianco gave him such a clap on the back I thought he was going to knock him over. “That’s because it’s very soft,” he exclaimed. I’m happy to say Chris and Francesco didn’t buy any of that wine. Prosecco was going to appear on the Marea list several times, “definitely by the glass,” said Francesco, and Chris agreed. “There will be no more than four Proseccos,” Francesco declared. “I have five,” Panebianco replied. Francesco, looking impeccable in a close-fitting pinstriped suit, scribbled something in his tiny notebook. Our next meeting took place several days later, at the annual spring tasting of a distributor with a very large portfolio of wines from all over the world. As one of the largest and most important trade tastings of the year, it’s impossibly crowded and sometimes even rowdy as retailers and restaurateurs jockey with each other for a taste of the many wines. We were all fans of the Pierre Gimonnet & Fils nonvintage, an all-Chardonnay grower Champagne with brilliant acidity. I liked the softer, slightly fruity Marc Hebrart nonvintage as well. Chris and Francesco said the Hebrart was a more popular style that would appeal to a wider range of tastes than the Gimonnet. Next we moved from Champagne to Italian, Austrian and Hungarian wines. Chris and Francesco weren’t just tasting for quality and menu appropriateness; they were weighing their own personal preferences against popular taste. 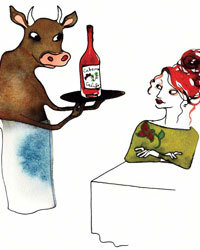 They found a few wines they couldn’t live without, like the 2006 Hirsch Vineyards Sonoma Coast Chardonnay. It was a truly outstanding Chardonnay, all satiny richness and minerality. “We’ll take all the Hirsch that you can give us,” said Chris to the salesman at his elbow. (When you buy a lot of wine, salesmen tend to follow you around.) Chris was able to buy two cases of the Hirsch. And yet, as we walked from table to table tasting the wines, Chris and Francesco kept naming non-Italians as the wines that most impressed them. There was a Hungarian wine, a minerally white blend by Kreinbacher, as well as a Spanish cava from Raventós i Blanc that was, we all agreed, sublime—as complex as Champagne. “This will find a home on the list,” Francesco pronounced. After several weeks and several more tastings, Francesco sent me the list. It was like seeing photographs from a fabulous trip: There was that Hungarian Kreinbacher ($56) and that wonderful Hirsch Chardonnay ($120), which would prove to any anti–California Chardonnay drinker that there were wines worth the money. There was even an old white wine that seemed to have been selected especially for Frank Bruni, the 1989 López de Heredia Viña Tondonia Blanco from Spain. 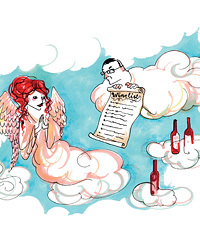 Now I had a much better picture of the many challenges—and rewards—inherent in creating a truly top wine list, and more insight into how wine directors maintain their point of view while also considering the customer’s preferences and prejudices. A Pelaverga (or two) for the former might be countered by a Barolo for the latter. I was impressed, and even occasionally thrilled, by the choices Chris and Francesco made. That Hirsch Chardonnay! 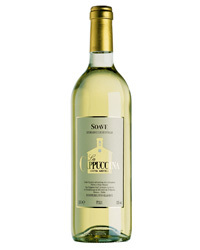 That delicious cheap Soave! There were lots of wines on the list that I’d be happy to buy, at prices I’d be happy to pay. The only question that remained was how well the wines went with the food. And since the food was so important, this seemed like a pretty critical detail. But how to experience both together when Marea’s kitchen was still under construction? Chris had a plan: “We’ll have the dinner at Alto—a nine-course tasting from Marea’s menu, with lots of wines from the list,” he told me. Both Chris and Francesco were waiting when I arrived. Francesco had selected 22 wines from his list to pair with the nine courses. (There were spit buckets on hand.) Chef White’s first course was crostini topped with sea urchin and lardo—two of the chef’s favorite ingredients, Chris told me. “There will be a lot of both on Marea’s menu,” he confided. Of the three light-bodied, fresh Italian wines that Francesco chose to pair with the crostini, I was particularly keen on the 2007 Gavi from Cascina Degli Ulivi—its brisk minerality was beautiful with the creamy richness of the lardo and the sea urchin. The next three courses included seafood sausage in a delicious tomato sauce, a glorious poached tuna with a Piedmontese anchovy sauce and a perfectly seared, perfectly tiny bit of octopus, all paired with several more white wines. Then came two pasta dishes: spaghetti carbonara with shrimp and sea urchin, and cuttlefish risotto. (White is an undisputed pasta genius; his carbonara is one of the great culinary gifts of our time.) Francesco selected several reds to pair with these dishes, describing each of the matches in loving detail. It was the longest I’d ever heard him speak, but his explanations were precise and effortless—as was his pronunciation of multisyllabic grapes. “The Ormeasco di Pornassio Peinetti is the Dolcetto of Liguria,” Francesco said, as if acquainting me with a favorite piece of art. He even had the intonation and the hand-sweep reminiscent of a gallery director as he indicated the first red paired with the cuttlefish risotto: “This has ripe, bright fruit and a wonderful acidity that melds almost invisibly with the cuttlefish.” He did the same with every food-and-wine match. The wines, save for a couple (I will never like Coda di Volpe any more than I do Asprinio) were as intellectually challenging as they were pleasurable. These were clearly wines that Chris and Francesco both loved. And that’s what it takes to make a great wine list. Whether an $8 Soave or a $300 Chablis, the list must be full of bottles that the wine directors themselves love. Or at least most of them should be—there are three Pinot Grigios on the Marea list I’m going to ask Francesco about.